I thought it would be worth starting a new thread, or at least one with a totally appropriate title. And here are some of my images. Please, generally speaking, disregard the finishes. They are basically place holders. I realize that my bricks aren�t Roman bricks, and the wood looks fake. 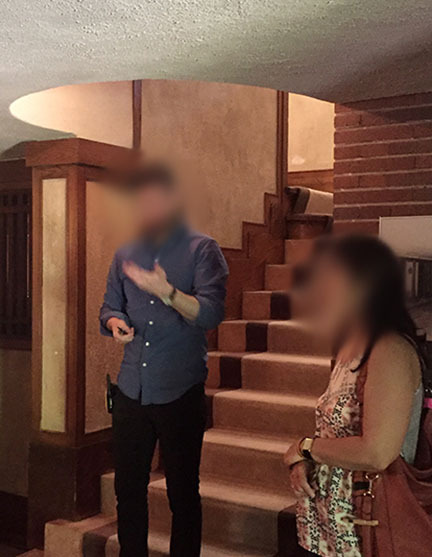 I also realize there are no light fixtures, furniture, or prints. Those will come with time (hopefully). Here are my questions, in no order. 2. How would you do the glazing for the tall thin strips on either side of the main windows? In the elevations it seems to have no wooden frame like the rest of the windows do. Would it just have a thin lead came around the perimeter and that�s it? I welcome your thoughts. 3. Speaking of windows, do you think the frames are too thick? They are at 3� currently, which doesn�t seem too bad (same as most of the trims), but I feel like it looks heavy in the middle of the double windows. Perhaps thin it out so the center is 3� overall instead of 3� at each window? 4. I made the vases at the doors metal and put a series of red squares on them. This was taken from the color section, which shows some kind of decoration to them. What do you think? I imagine it to be enameled onto the metal. 5. I have two different drawer pulls here. One is supposed to be metal and the other wood. I gave a bevel to the edge of the wood pull, but I am strongly leaning towards the metal one. All I can tell from the elevations is that they are definitely square. I know Wright did metal pulls, but did he do wood ones? 6. The trims in this space stick out 2� in most places, including the base board. However, I feel that the drawings bear me out in this aspect. Still, do you think they are too thick in places? Also, what do you think of my treatment of the baseboard going up the stairs? I�m not a huge fan of it, but I know Wright did do treatments like this around this time, but it seems pretty heavy. Unfortunately, I�m not coming up with a better idea. Any suggestions? 7. What do you think of the fireplace? It�s simple, but I don�t think it needs to be more than it is. It reminds me of a much simplified version of the Meyer May living room fireplace. 8. The closet under the stairs seems awkward, but I don�t know how to make it otherwise. Having the stairs cutting into the interior like that seems sloppy but unavoidable. It�s kind of a moot point as there will eventually be a curtain at the door opening, but it still bothers me. 9. What do you think for a color palette for this? Oak and a cream plaster like I�m showing? Something darker? What about the carpet? What color for the brick? I�m not knowledgeable enough to know if he was using specific woods at this time or not. Perhaps this will just be up to my own taste? I�ve not settled on anything yet. 10. What should I do about the trim on the wall with three windows? It goes around the perimeter of the wall, but there is that door on the left and I don�t know how the door should interrupt it. Thanks in advance for your thoughts, and I apologize that this post is massive. I will try and reply in a timely fashion, but please be patient if I'm don't immediately reply. Good start. It's risky to guess what an architect would have done; it's not a great way to gain respect as someone doing historic recreation. But it seems unavoidable, in a case where there aren't enough drawings available to answer every question. So, I'm reluctant to go too far, here -- but I can comment on a few of your questions. The best advice would be to exercise restraint; invent as little as possible, don't decorate an area or an object in the man's style if you can leave it plain instead. The stair base molding might come under that category. 2. I had hoped to find an example in Wright of art glass panels set into an opening with virtually no trim; I didn't. A panel, which would have at least a came edge if not a steel one, could be set against a very narrow wood molding and kept in place with a second identical molding; these could be c. 1/2" square, of hardwood, or even smaller if metal -- I suppose. 3. No, the window frames are not too thick. Definitely do not narrow the meeting stiles to reduce their impact; Wright never did that as far as I know -- certainly not this early in the career, at any rate. 6. The baseboards look like they do in the original drawings, so they're okay, I think, despite seeming too thick in some close-up views. 7. Your fireplace seems fine; an excellent take on what he did, over and over, in the Prairie period. 10. Wall trims should return where possible, following the right-angle intersection of two planes -- rather than just being cut off at the arris. As long as there's a reasonable place for the end of a molding to land, such as into a broader molding around an opening, that's where it should go. 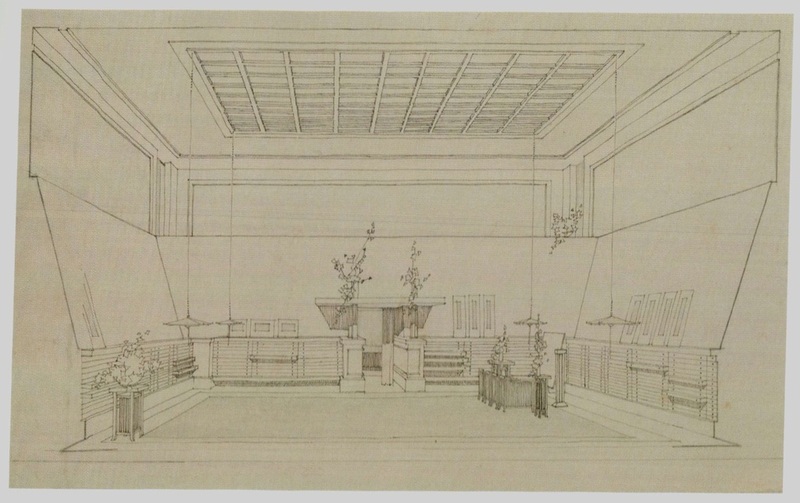 Wright was a beautifully logical and consistent designer; like all good designers he kept himself out of trouble by not instituting a formal system that would get him caught -- "painted into a corner," as we say. 2. 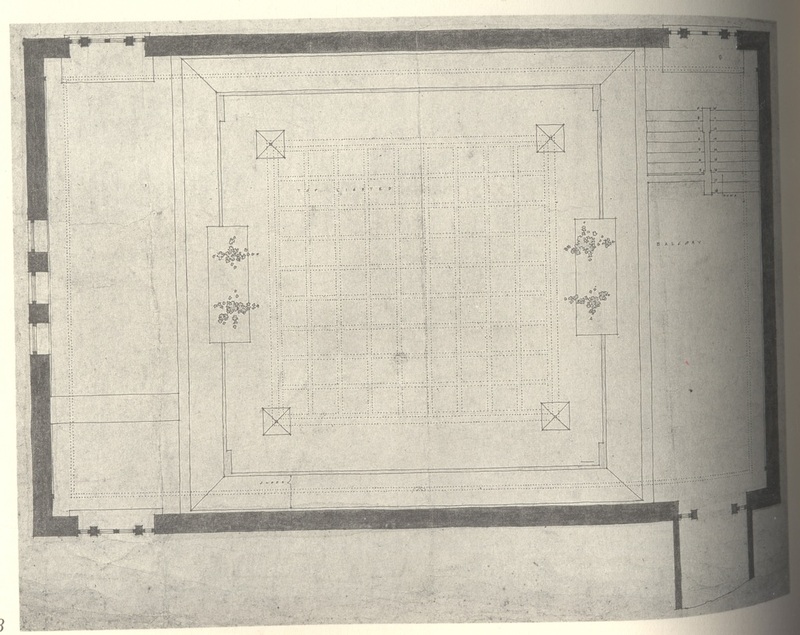 There is a wood framing shown on the plan that does not appear on the elevations, but that is probably due to the scale of the drawing. I would follow the plan rather than the elevation. 3. Standard for a 2'x4' casement is 2"; 3" for windows as big as these is not at all too thick. 4. The vases are a continuation of the posts that support the ledges over the doorways, which would be wood. I don't know of any vases from that period that were made of wood, however. Perhaps they were intended to hold dried plants? 6. The thickness of trim can depend on the scale of the drawing. What may seem to be 2" may simply be what is necessary to show the trim has thickness at all. Don't assume that to be the case. 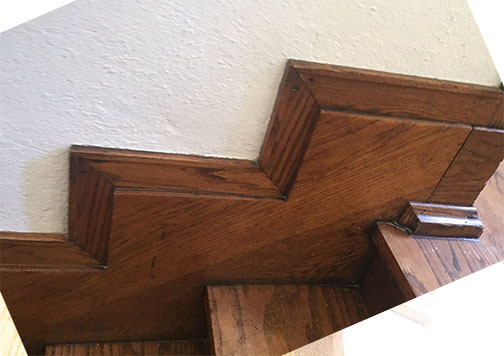 The baseboard at the stairs is too wide. Check the photos of Charnley on pp 19, 105, 111 and 163 of the book on the house edited by Richard Longstreth. Already FLW made the baseboard following the steps much narrower than the baseboard around the rooms. Where your trim is significantly too thin is the caps of the rails. 7. The fireplace is about as simple as the one at the Browne Book Store on page 107 of "The Early Work," even though they differ in plan. 8. The ceiling in the closet depends on the height of the riser. There are 18 steps, so even if the risers are only 6", the 16th step would be 96", 8', with enough room for the door and a sloping ceiling within the closet. I don't see the problem with that. The Spaulding print collection (or a least part of it) wound up at the Museum of Fine Arts in Boston. 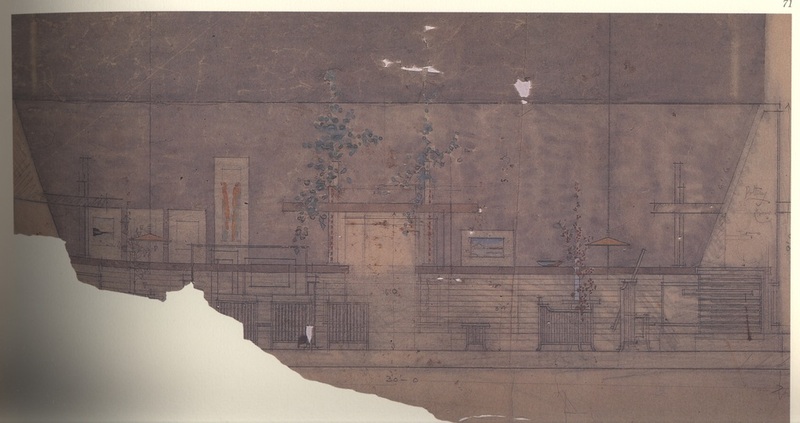 Type "Frank Lloyd Wright" in the search tab on the website and it brings up anything related to Wright. There are great period photos of the Imperial Hotel which illustrate how truly wonderful the Interiors were. 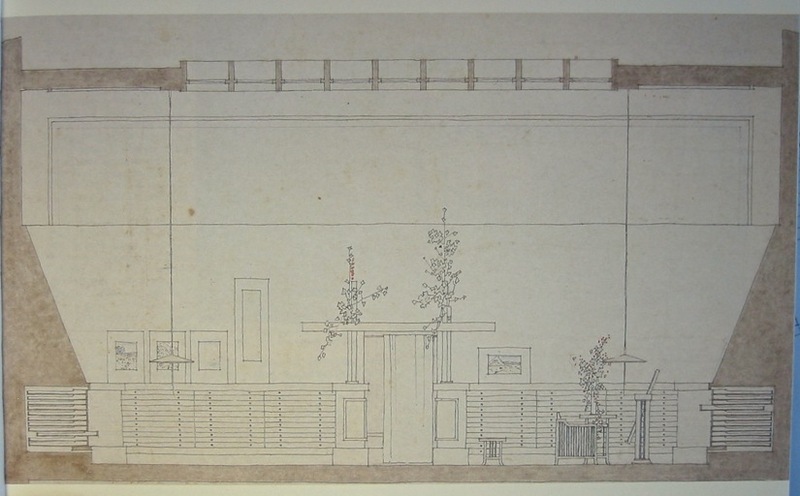 Any of the prints in their collection owned by Wright can be seen as a result of the search. a houseful of oaken snakes. The Fricke stair photo is one of my favorite Wrightian images. "Take THAT, ye Austrians and Scots !!" It's hard to find a piece of material here which doesn't turn a corner -- at least once . 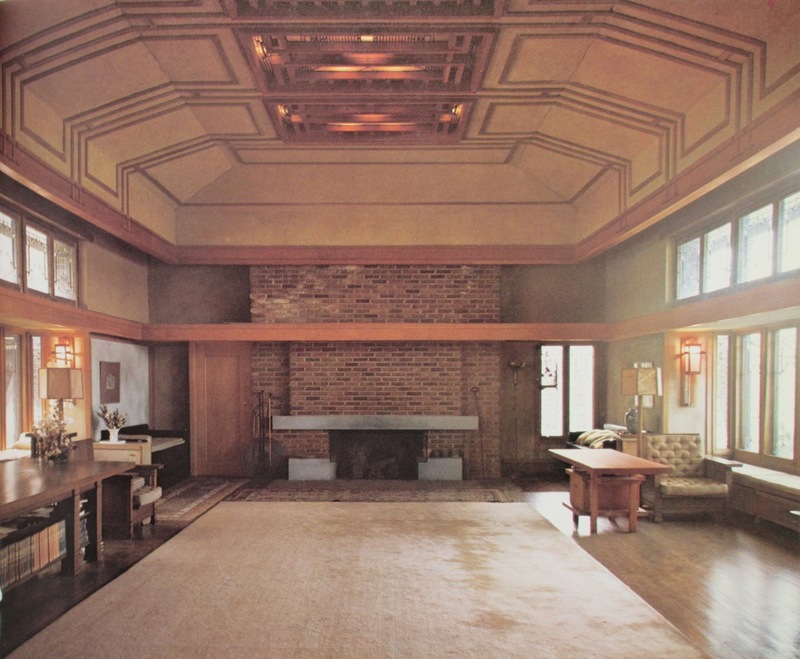 . .
Is that Home & Studio fireplace the 1911 version when FLW remodeled? Tis indeed Robie. Here's another snapshot taken from the top of the stairs, hugging the back of the fireplace. There wouldn't have been enough headroom for the stairs without the creative cut out of the semi-circle in the lower ceiling. Good lord. What went wrong at St Peter's Seminary ? The extant work is wonderful. 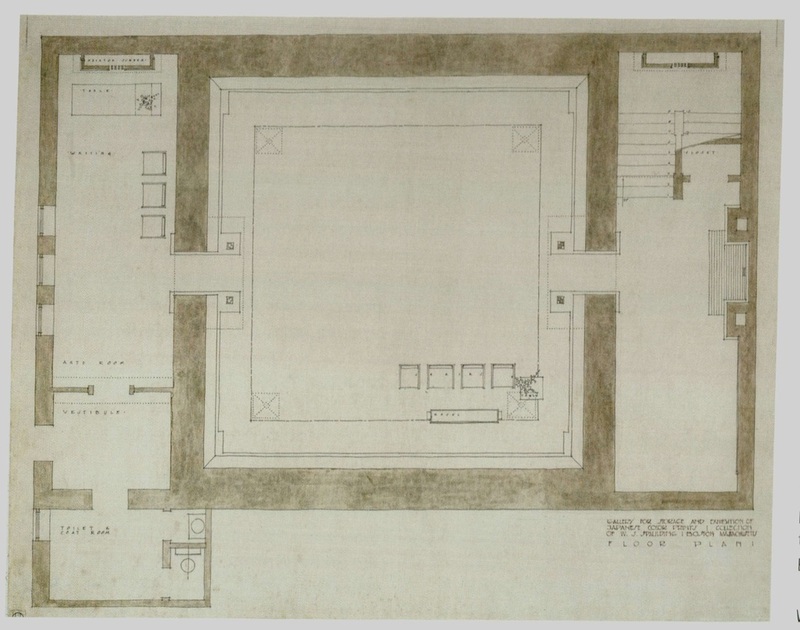 One sees echoes of Mackintosh in the New Scottish Parliament building (not shown here) ? I don't know that the fireplace at the Studio was altered when other changes were made. Anybody ? 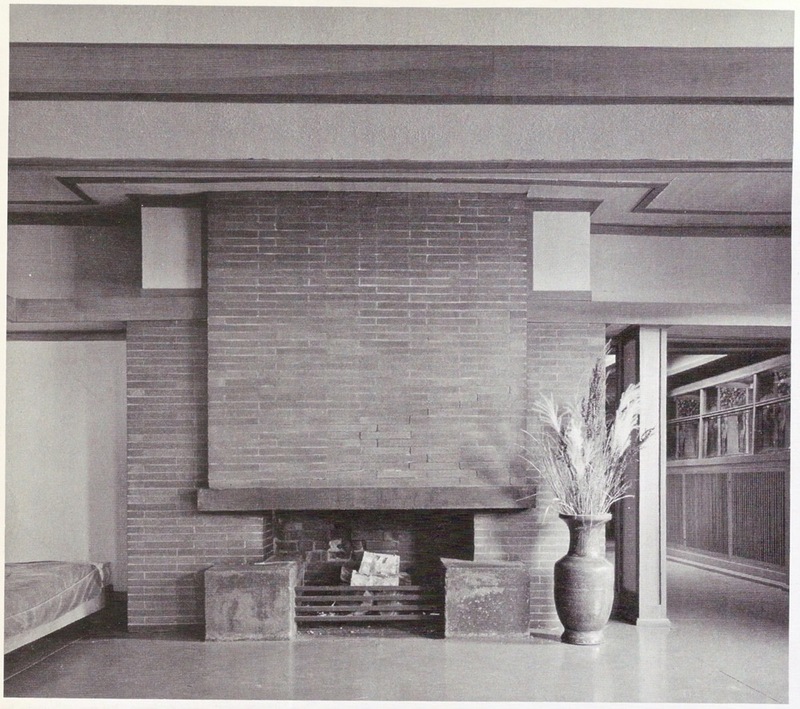 A photo on page 42 of The Frank Lloyd Wright Preservation Trust's 1988 publication on the Home and Studio shows the same fireplace (and other room details), two armchairs, and a very large vase; the caption reads, "The drafting room became a living room in 1911." 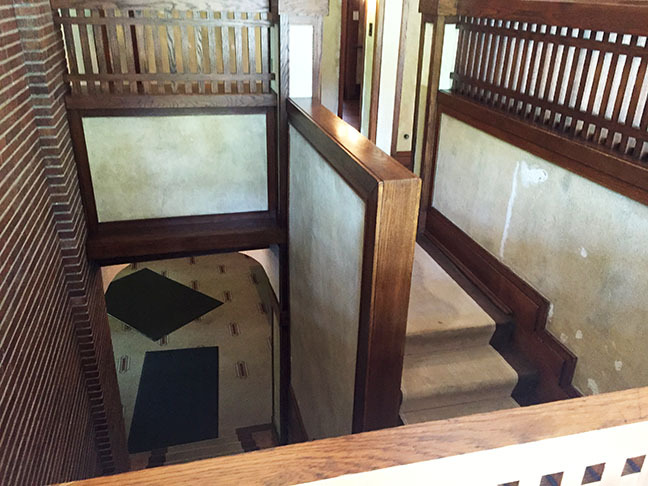 The stair in your section has zero room for a continuous beam -- the lower half of a typical stair stringer. So, I think you need another six inches or so of clearance between the thinnest part of the stringer (intersection of tread and riser) and the closet ceiling. 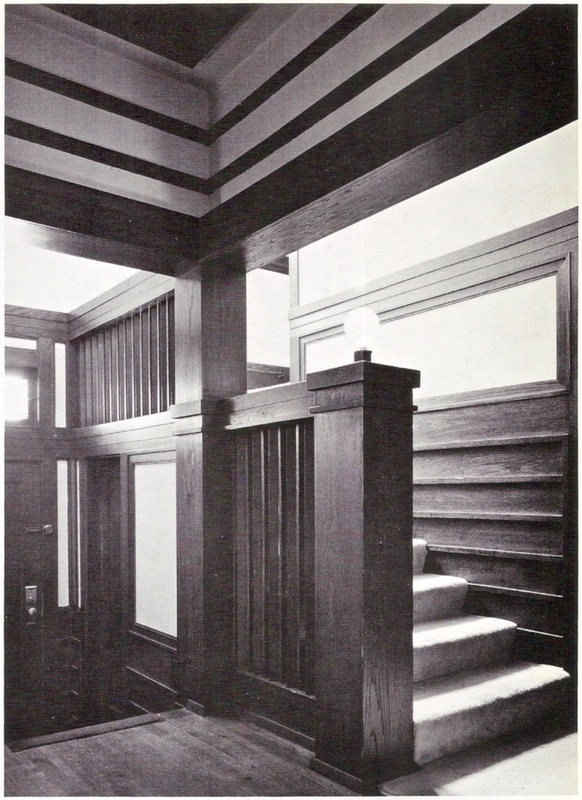 As the stair-step overhead seen in several Wright houses is not a natural occurrence but is instead a laboriously-realized aesthetic choice, and as this one occurs in a closet, I'd let it go . . .
Only a zig-zag steel beam could support the center of the stair as you've drawn it. Perhaps it could be achieved in wood if the stair didn't need a center stringer and the treads could be supported by wall stringers only ? 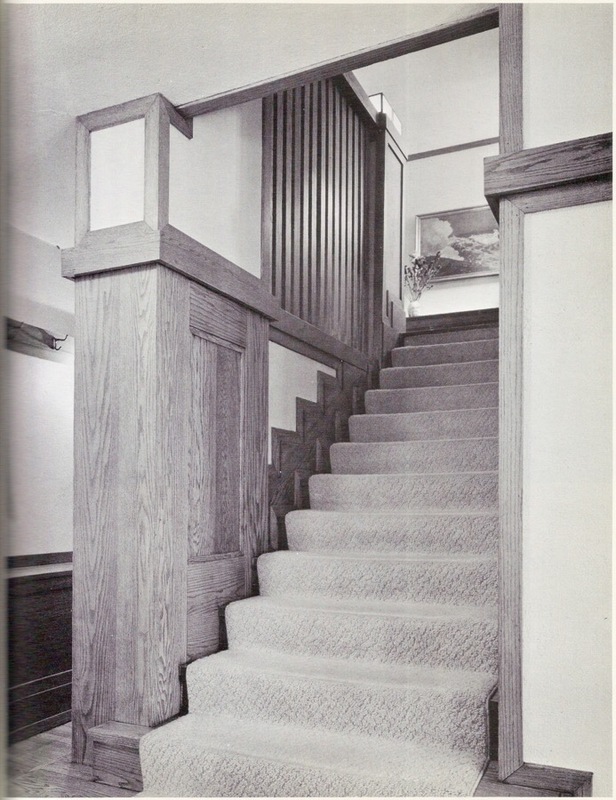 A robust riser board would make an effective beam; I assume that risers are considered a structural part of a wooden stair, at least to some degree. 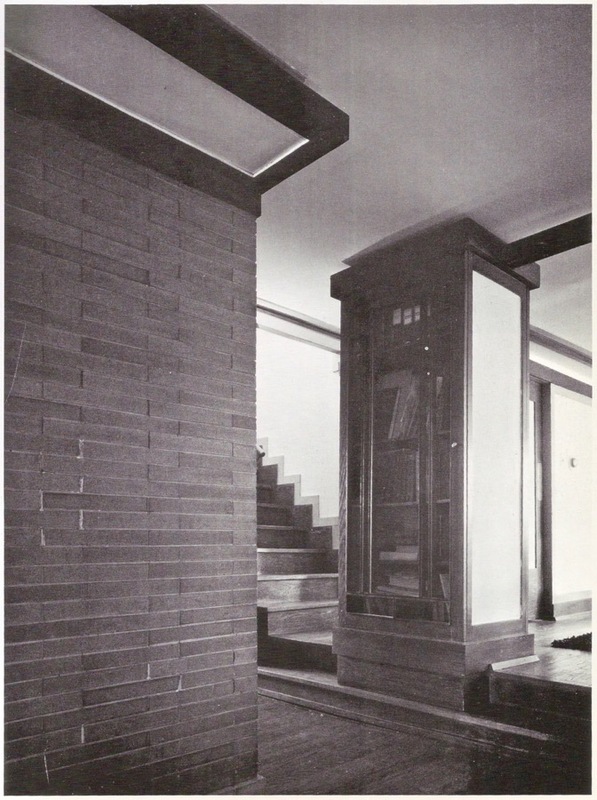 It may be that Mr Wright's adoption of the stepped stair baseboard has to do with his avoidance of the diagonal line. I see no handrail in that Robie stairwell. I wonder if the diagonal wood grain there bothered or disappointed him . . .